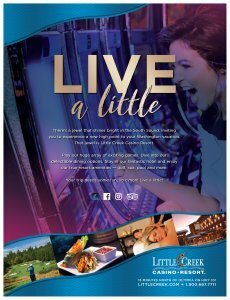 Little Creek Casino Resort turned to KK BOLD for a fresh new brand and a consistent approach to marketing the property and its many amenities. Starting with a discovery session in December 2017, Little Creek and KK BOLD combined forces to develop a new communication plan, review existing marketing materials and methods, establish consistent branding throughout casino properties and identify opportunities for growth. 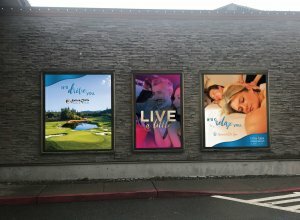 The first step in rebranding the casino was development of the “Live a Little” tagline and a fresh new graphic design that conveys the energy of the property. KK BOLD and Little Creek’s marketing team launched the new brand via the casino’s traditional, online and social media marketing campaign. “Live a Little” also makes quite an impression as the tagline whizzes by on the sides of mass transit buses in the area. Phase 2 will kick off in May and will focus on extending the new brand to Salish Cliffs Golf Club and Seven Inlets Spa, both integral parts of Little Creek’s broad variety of resort features. Two thumbs up to the creatives and designers for putting together a beautiful, sophisticated, modern look for the casino. Personally, what a great little tagline, no pun intended. Nicely done!